To open the sunroof (autotilt feature), press the tilt button (2) on the overhead console (for more than 0.5 seconds). The sunroof will tilt all the way open. To stop the sunroof tilting at any point, press any sunroof control button. 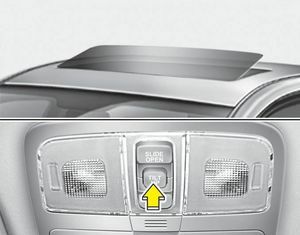 To close the sunroof, press the close button (3) on the overhead console and hold it until the sunroof is closed.